This month looks at fresh materials to spruce up the work space. When a small metalworking factory has been manufacturing industrial components, including aircraft parts, for 40 years, you know that it has a wealth of accomplished craftsmen with expert technical knowledge. It’s interesting then to see what such a company would produce if it applied those skills to interior design. 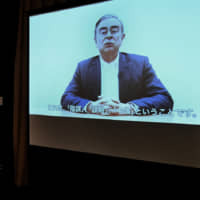 Shion in Gifu Prefecture has done just that with its Neighbor range of industrial-inspired products. 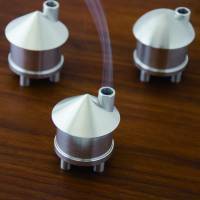 Its metal koma spinning tops — so perfectly balanced that they can spin up to 15 minutes — perhaps showcase the company’s manufacturing precision skills the best, but it is the Pi-pin and new Aroma House designs that are particularly attractive. 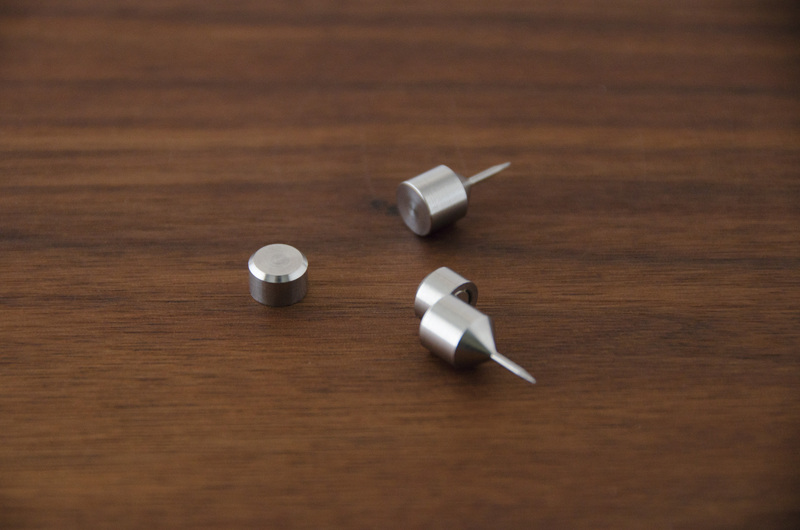 The Pi-pin is a stainless steel thumbtack that allow you to pin photos, postcards and other documents without damaging them. The head of the cylindrical tack is split into two parts, with the top piece concealing a strong magnet that secures the document to the pin. This means no tiny holes and you won’t need to pull out the tack to attach something different. 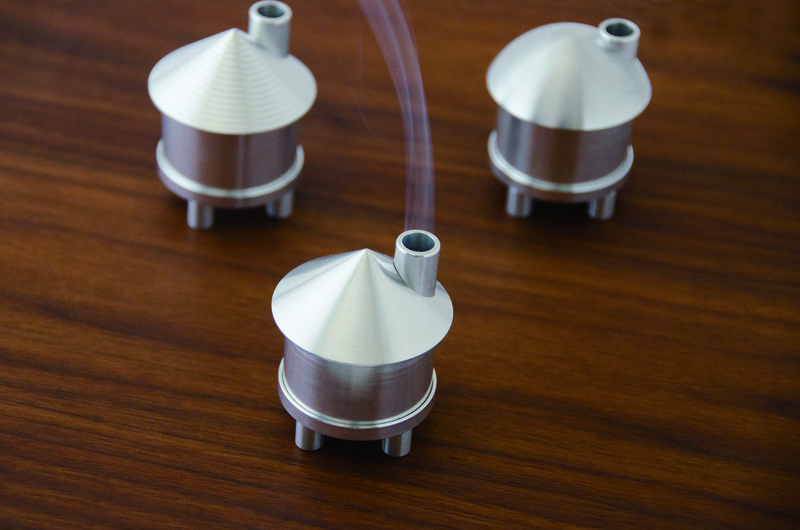 House-shaped incense burners aren’t new, but unlike most designs, which can be a little kitsch, the Aroma House takes it to a sparse modernist level. Crafted in silver brushed-alloy, it looks like a cylindric engine part topped with either a conical or domed roof that sports a chimney to release the incense smoke. 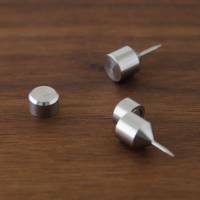 Pi-pins are sold in pairs for ¥1,706, while an Aroma House is ¥6,264. Also building-themed are Feelt’s new trio of Desktop Organizers, which are made of a unique compacted blend of polyester and recycled PET fibers. 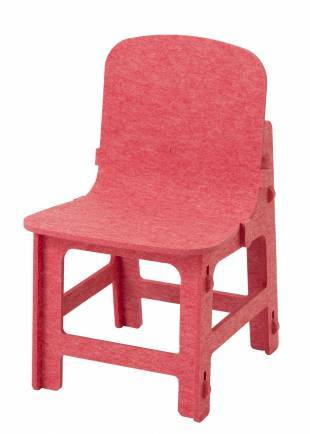 Feelt’s DIY flat-pack RK-Chair, designed by Michihiro Hayashi, won a Kids Design Award this year for its clever use of the sturdy textile, which is as stiff as wood but more flexible, lighter and water-resistant. The Desktop Organizers, again designed by Hayashi, come in three architectural looks — a rectangular tower block, a side-gabled building and a barrel-roofed structure. They each display the innovative ways the qualities of thick felt can be utilized: Pliability allows a system of slots and flaps to create seamless joinery, while its general stiffness means deep scoring can be used to make folds. The barrel-roof, for example, acts as a lid with its multiple scored folds unrolling flat to open. The textile’s satiny texture also means that Feelt products won’t scratch surfaces and are safe for children. Feelt Desktop Organizers will available from late October, priced at ¥3,240. 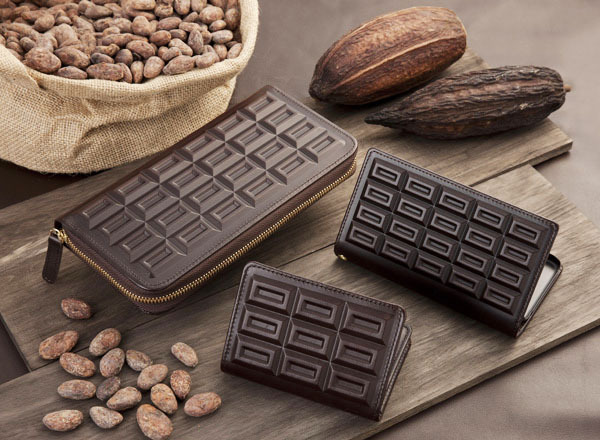 Chocolatan Kobe spent several years working with established Kobe leatherworkers on one very specific mission: To make a range of notebook covers, pass cases and other goods that look just like chocolate. And they really are quite convincing. Molding leather into distinct 3-D shapes is a difficult process, but here it has been achieved with crisp detail and without distorting the leather’s natural matte texture, which is already akin to chocolate. The inspiration for this collection may be sweet, but the result is not childish or twee in the slightest. Chocolatan Kobe products include bags and iPhone covers and come in a range of tones from white to dark chocolate, as well as a few unusual indigo items. Prices range from ¥5,400 for a pass case to ¥64,800 for a large bag.